Actually, I love being caught in the rain. Unless I have electronics on me. Or I'm on my way somewhere important. Rum soaked layers. Must have. You said Piña Colada?????? I love Piña Colada is my favorite drink with Mango sour (a delicious) this look fantastic Grace, I have to do soon, Have a lovely Valentine day. I might be okay with getting caught in the rain if I had a few pina coladas in my system. At that point...I would probably not even realize I was caught in the rain. This cake looks so delicious. I would prefer this to chocolate on V-Day. For sure. 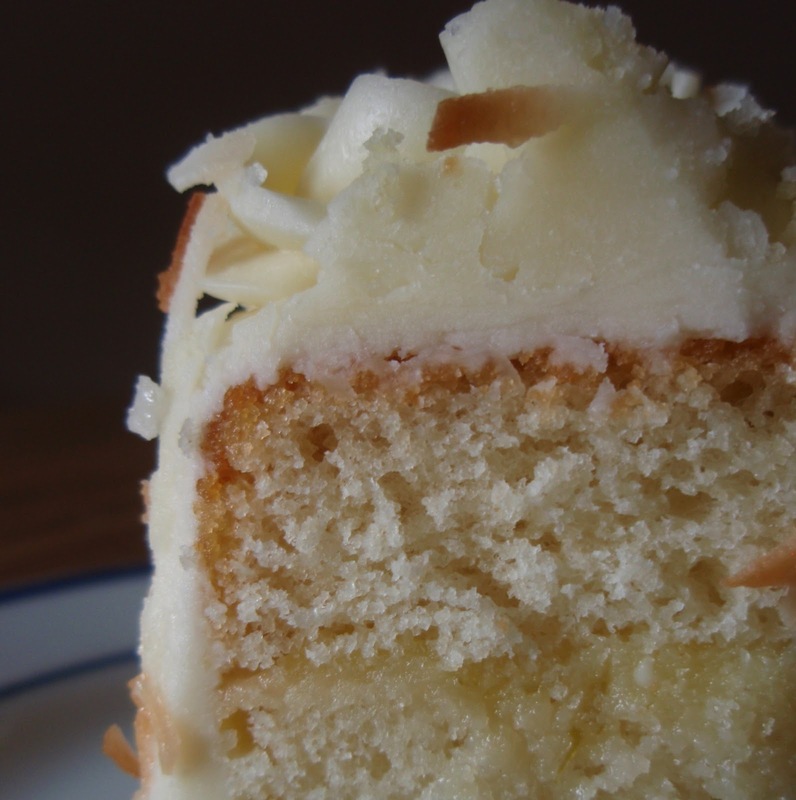 Torted Coconut Cake. Rum soaked layers. A velvet suit. Ooh-la-la! For my part, I've been caught in the rain for at least fifteen years now....but that's another story. I love it even though I have no cold winter blue..;-) Looks delicious! Heavenly! That is one of ma favorite flavors. Lime curd, rum syrup, and toasted coconut--how could this not be amazing? The cake looks tender and delicious too. Great job! I have to say I am not one for Chocolate on Valentines Day so when I saw this recipe my mouth started to salivate. How Delicious is this!!!! I will post this recipe to my blog, areyougoingtoeatthat.org, soon and tell you how it came out. Must try so thank you for sharing. Now you are very, very naughty for getting that smarmy song stuck in my head, but I will forgive you because that cake looks divine. Ooh la la indeed! Wow! I bet you could up the pina colada factor with a pineapple curd. I often write the Happy VD on the mirror to get chuckles at home. I love splashing out in the rain-as long as there isn't lightening nearby. Que receta tan fantastica, esto es una verdadera delicia. Ooh-la-la that is a very magnificent cake Grace. And I think I might just give Swiss Meringue buttercream one more go (somehow it never seems sweet enough for my palate). Ooh la la is right. From the lime curd to the rum-soaked layers to the Swiss meringue. You don't need red and hearts to fall in love with this one, Grace! What a unique recipe! I'm liking it! I'm so glad you enjoyed your first foray into Swiss meringue buttercream! Once you start, it's hard to go back, lol! Looks like an incredibly delicious cake, Grace! I'm loving this idea!!! Looks so moist and delicious. I went crazy chocolate today, but I might trade you a cupcake for a slice of this! Happy Valentine's Day! What I would give for a slice right now... YUM! Happy VD to you too, Grace! Beautiful and tempting looking cake! Love your cake. Swiss meringue is my FAV! I have the rain so now all I need is my honey and some Pina Coloda Cake. There is a whole lotta love going on in this cake! Love all of it! Have a great VD yourself! This cake sounds amazing! Love the rum syrup and the lime curd here! Oooh, looks great, Grace! 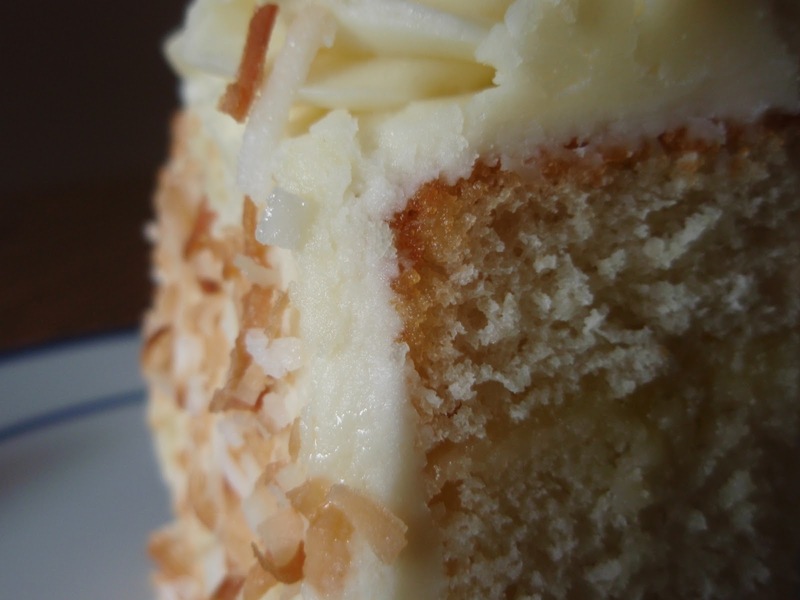 I love coconut cakes. This cake looks delicious! Your photos are amazing!! So, are you giving me permission to make this cake for just me and my girls? We are the only ones who love coconut. No I do not like getting caught in the rain. However I will definitely make my way outside for a warm rainy day, sans thunder and lightning. And as for Pina Coladas, oh yeah, love it! You really made me laugh today. Thanks!! I really have to try this out especially the meringue. Awesome! What an amazing, huge, pretty & fab looking builded cake!! I love the syrup here too! What a lot of work though,...It is like ART!! REAl & PURE ART! Oh man, yum yum! That icing looks amazing! Bring it on. I'm ready. OMG...Grace...this looks and sounds heavenly. Book marked for sure!!! Ooh, love this cake! Hope you had a happy V Day too! That is one gosh darn beautiful cake! I must remember this for my husband's birthday, it's right up his alley. Yes I like Pina Coladas :) Love this! OMG, yes i like pina coladas, and walks in the rain, now please send me some of that delicious cake! it looks so very very good, what I wouldn't give for a big slice of that cake and a glass of milk! Ooo that lime curd sounds too good to be true! I like your rebellious spirit, girl! Haha, happy belated VD! Colada cake looks awesome. Rum, lime, coconut.. all my favourite things. Oh how I love the thought of a Pina Colada at this very moment. Oh yes, it snowed, again!!! Somehow, I feel all warm and cosy just thinking about your lovely cake. Ummmm this looks amazing! I love anything that involves coconut...yum!